Memorial Day is this Monday, and we always think of it as the unofficial start of summer, a day of BBQing or shopping, a (possible) long weekend away from work and perhaps traveling to see family and friends. But it is also a day where we remember those who died serving our country. My family and I will be traveling to see some relatives and enjoy a BBQ. But we’ll also spend some time at a local National Cemetery placing flags on fallen solders’ gravesites. What are your Memorial Day weekend plans? Let me know. Reminder: Our Panel Support Center will be starting the Holiday Weekend a little early. Our team will be available Saturday from 10 a.m. ET to 2 p.m. ET to assist you. We will be closed on Monday in observance of the holiday. We’ll be back on Tuesday May 30, at 9 a.m. ET. If you haven’t already done so (depending on where you live), now’s the time to get out and work on your garden. My husband and I have spent the last few (dry) weekends raking and cleaning up, getting ready to start our planting. Gardening is a favorite hobby for many people. And even if it’s not your favorite activity, many people still do it. In fact, according to gardenresearch.com, 74% of all U.S. households participated in lawn and garden activities in 2016. The average amount spent on gardening per household was $407. Food gardening and flower gardening were the most popular gardening activities, according to the National Gardening Survey. About one out of three households participated in food gardening (36 percent) or flower gardening (34 percent). Households spent an estimated $3.6 billion growing vegetables, fruit, berries and herbs and $2.7 billion on flower gardening. Anyone have any good gardening tips they’d like to share? Let me know, I’m always interested in learning more about gardening. Please record all your lawn and garden purchases. 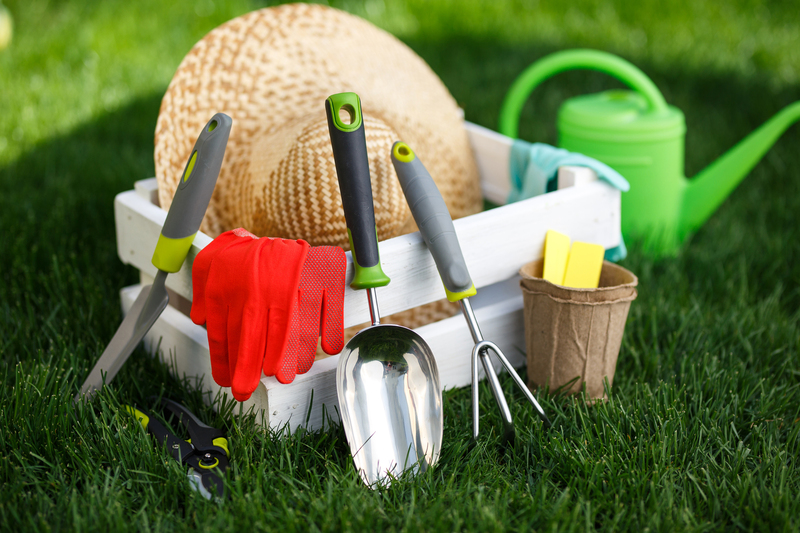 Many of the items you might buy for your garden or lawn are large or come in big, bulky packages or containers, such as topsoil, fertilizer, wood chips, rakes, wagons, wheelbarrows, and so on. These types of items are typically stored away in garages or sheds before and after use, so before you store these don’t forget to scan them. Enjoy your weekend, and get outside if you can! This Sunday is Mother’s Day. This year, my husband will be cooking dinner for me, my mom, and my mother-in-law. It should be interesting! While my kids usually make me a special gift, I know a lot of other mothers get gifts purchased from a store or restaurant. According to the National Retail Foundation, total Mother’s Day-related spending is expected to reach $23.6 billion, compared with last year’s previous record of $21.4 billion. What are Americans planning to buy the moms in their lives? How do you celebrate the mothers in your life? Let me know! I’ve been so busy lately that I haven’t had a chance to start my spring cleaning. But I decided that this weekend my family and I were going to do a nice, deep cleaning. In particular, my husband and I wanted to make sure our kids – who are still fairly young (9 and 11) – learn the importance of keeping things nice and clean. But I wasn’t sure of what’s the best way to engage them. Use a cleanup song: Find a song the kids like, and sing it as many times as you can possibly stand it! Start with one-step commands: The task should be small, perhaps no more than 5 – 10 minutes. Once they’re finished, make sure to give some positive reinforcement. Focus on the successes: Make the chores fun by focusing on what your child is learning and doing well. Spring cleaning is an excellent opportunity for your kids to learn responsibility and grow their self-confidence. Are there any tips you have for getting children to chip in with the cleaning? I’d love to hear about them! Remember: At this time of year, it’s important to remember to scan all of your spring cleaning item purchases for both indoors and outdoors, such as brooms, mops, disinfectants, storage bins, rug cleaners, trash bags, lawn care/garden products, and so on. Also, before you put large, bulky items such as topsoil and fertilizer into the garage or shed, please scan them first so you don’t forget about them.